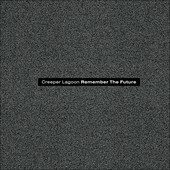 Remember The Future is Creeper Lagoon's first record since their Dreamworks debut, Take Back The Universe and Give Me Yesterday. The latter record featured an entirely different line-up, including a different vocalist, Ian Sefchik. After the demise of the old Creeper Lagoon (though not the first Creeper Lagoon to fall apart and experience line-up changes), band founder/songwriter Sharky Laguana has regrouped with a new cast of players, taken on the duties of lead vocalist, and written a new record. That new record, Remember The Future, finds the band treading more spacey waters, as they navigate through darker, sometimes even dreamier sounds, looking for the light as Laguana deals with a hellish past few years, putting them behind him as he forges ahead. The smoldering pop of "The Way It Goes" is an instant grabber, the piano hooking you while Laguana's lyrics deliver a story of life that transcends beyond the experiences of Laguana and become your own. The acoustic "There's A New Girl", pushed by the rhythm section, soon turns into a buzzing rocker, keeping the pace and tempo the same, though injecting the song with loud guitars that give everything a completely different mindset. And then there is, "Crisis", the album's closer, a song that finds the band going out on a high note, the spacey, melodic number calling for you to dive in and swim around while Laguana and band keep you entertained. If Laguana ever had any doubts about his decision to carry on as Creeper Lagoon, Remember The Future, should put those to ease. Not as much a straight ahead rock band as before, Laguana's pop sensibilities and songwriting are still the same, and his new vision - thus new direction - are both promising and interesting. I'll give it a B.